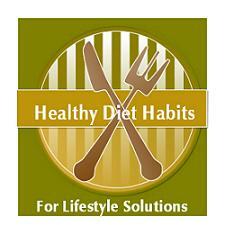 Lifestyle Solutions Recommended Books - Mindless Eating by Brian Wansink, P.H.D. Most of us with a weight problem, have gained weight slowly over the years. If you gained 10 pounds this year, you have overeaten 100 calories per day. This is not a lot of food. The notion going around, is that you must mindfully eat. Such a small error in your eating caused this weight gain, so you must count your calories carefully each day. There are many websites set up to help you keep track of every single thing that you eat. You must not diet, because we all know that dieting does not work, but somehow magically get all of your habits, emotional eating and overindulging under control. This is exhausting! What if you looked at your ten pound yearly weight gain in a different light and thought, "I am only overeating 100 calories per day, and this is not a lot of food. I do not need to change my entire life and count every single calorie that goes into my mouth." What if you chose 3 areas of your eating, and cleaned them up a bit. One of our Recommended Books - Mindless Eating by Brian Wansink P.H.D., encourages people to do this. Choose three habits, or areas in your eating life that you can clean up. You might substitute an Americano for your latte, and save over 200 calories a day. You might use light margarine on your toast, and save 100 calories per day. If you keep a food journal for a week, you will begin to see many areas where a few changes can be made that will result in many calorie savings. If you can decrease 500 calories per day, you should lose one pound per week fairly effortlessly! That would be 50 lost pounds in a year. Wow! A lifestyle change, does not mean that you must mindfully eat all of the time. It means, that you will clean up a few of your major trouble spots, and add more healthy foods in their place. Does it mean you will not ever eat a dessert again? No, but you might cut your quantity in half. Those giant Costco pies are not meant to be cut into eighths, but into sixteenths. Relearn your portions, make some simple personal changes daily, and add a few more veggies into your meals. You might be surprised that some simple changes can add up to a huge weight loss with little effort!!! 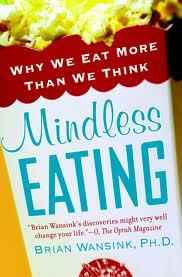 You can purchase Brian Wansink's Mindless Eating, book below, directly from Amazon.